To connect an attachment to a compact loader equipped with the Bob-Dock system, an operator lines up the loader with the attachment's Bob-Dock adapter plate. "Fleet owners, equipment managers and operators who worry about machine downtime will love the Bob-Dock mounting system because it prevents many common operator errors, like failing to disconnect hydraulic hoses before backing away from an attachment, and the system routes and protects auxiliary hydraulic hoses from tire and track contact," says Jason Boerger, Bobcat Company marketing manager. "The Bob-Dock system is also going to be a favorite of operators who will appreciate not having to leave their cabs to connect or disconnect hydraulic hoses." To connect an attachment to a compact loader equipped with the Bob-Dock system, an operator lines up the loader with the attachment's Bob-Dock adapter plate. The operator then presses the Power Bob-Tach switch inside the cab. The Bob-Tach system secures the attachment, while the Bob-Dock system automatically connects the hydraulics. The attachment is then ready to use. When you're done using the attachment, retract the Bob-Tach wedges and pull away. The hydraulics instantly release, providing simple, hands-free removal. If a loader has a Bob-Dock attachment mounting system installed, and the operator wants to use an attachment that lacks a Bob-Dock adapter plate, it's no problem. While the Bob-Dock attachment mounting system's floating coupler block equips your loader with a hands-free connection point, the standard couplers located on the lift arm remain ready to use. 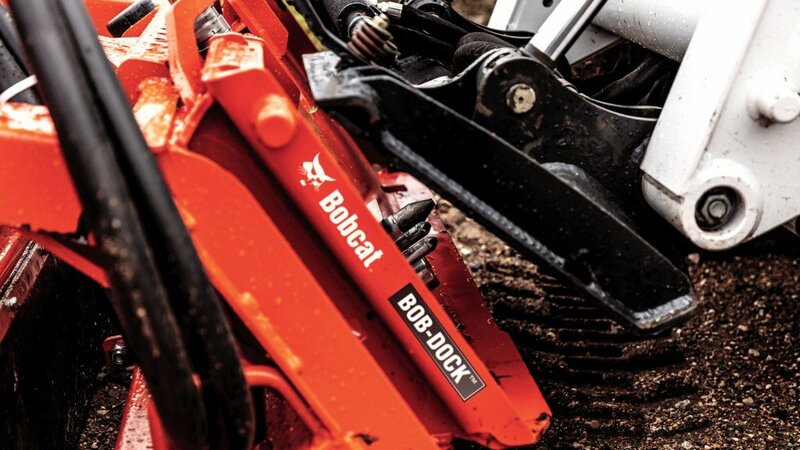 You can utilize the full lineup of approved Bobcat attachments - with or without the Bob-Dock adapter plate attached.